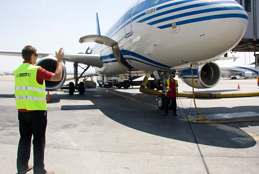 Aerohandling Operations Department provides extensive, one-stop shop support services with highly trained personnel, including in-house IATA certified Dangerous Goods training and the latest technology such as our own AMADEUS ALTEA DCS system, computerized communication system and state of the art Ambulift (a special vehicle for Passengers with Reduce Mobility). Our Operations are fully ISAGO compliant in regards to safety, as well as ISO 9001 in regards to quality assurance. Liaison with local airport authorities, obtaining traffic rights, landing permits and time slots. Weight & balance, loading/off-loading instructions reports, filing according to IATA, ICAO and airlines requirements. Message dispatch, ground/air communications, telexing important data via SITA and other software platforms. Sophisticated baggage sorter and supervision. We provide flight coordination and supervision, meteorological and aeronautical information, flight plan filing, flight watch and more. We arrange crew hotel reservations and transportation from and to the aircraft. Issuing the proper paperwork for technicians in case of need. We provide push back, GPU, ASU, ACU, etc; Arrangement for all necessary maintenance. We provide tracking of all the needed services and coordinating them during routation of an aircraft in the safest and fastest way.